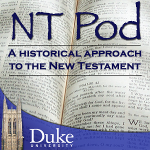 NT Blog: NT Pod 47: Did Jesus Exist? Hey folks. I have been having a real difficulty posting comments to the NTPod, and I thought I would make one more attempt tonight, but try the NT Blog site. I will email Mark in the AM, and see if he has a collection of flagged comments from me, or if for some reason my comments are just going off into space. Wish me luck, and if this works, tomorrow I have a interesting comment on the concept of the "did Jesus exist?" that I will be interested in getting some feedback on.